Spinning of polymer fibers for use in textiles and fabrics is a specialized form of extrusion, that uses a spinneret to form multiple continuous synthetic filaments. 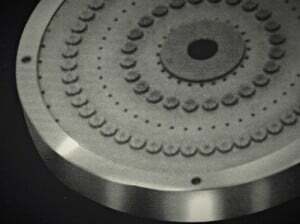 Ultrasonics can be used for various types of spinning: dry, jet-wet, melt and gel spinning. Ultrasonic applications include spinneret cleaning, mixing, dissolving, polymerization and shear- thinning. For the polymer to be spun, it must be converted into a fluid state. Therefore, unless the polymer is melted, it is dissolved or chemically treated to form soluble or thermoplastic derivatives. 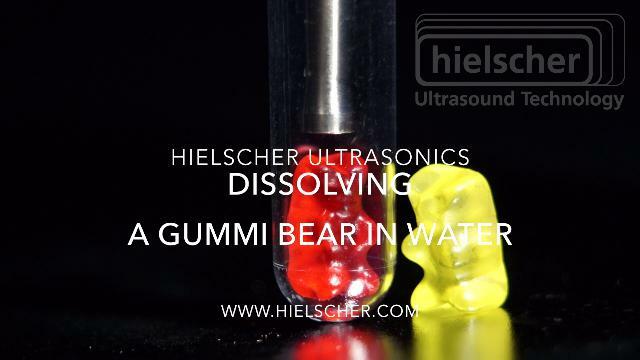 At this stage Hielscher ultrasonic devices assist and accelerate the dissolving process, as well as the chemical interaction with reagents. For this, solid polymer particles are suspended in the solvent or acid. This mix is either pumped through an ultrasonic reactor or processed in a stirred tank with ultrasonic probes, where the particles dissolve rapidly due to high cavitational shear. This creates a homogeneous and uniform polymer solution. Please see the video below for a demonstration of ultrasonic dissolving using a probe type ultrasonicator (UP200St). Viscous polymer solutions, such as poly(p-phenylene terephthalamide) (PPTA), in concentrated sulfuric acid are viscous and often non-Newtonian. The solutions require degassing to ensure continuous fibers exit the spinneret. 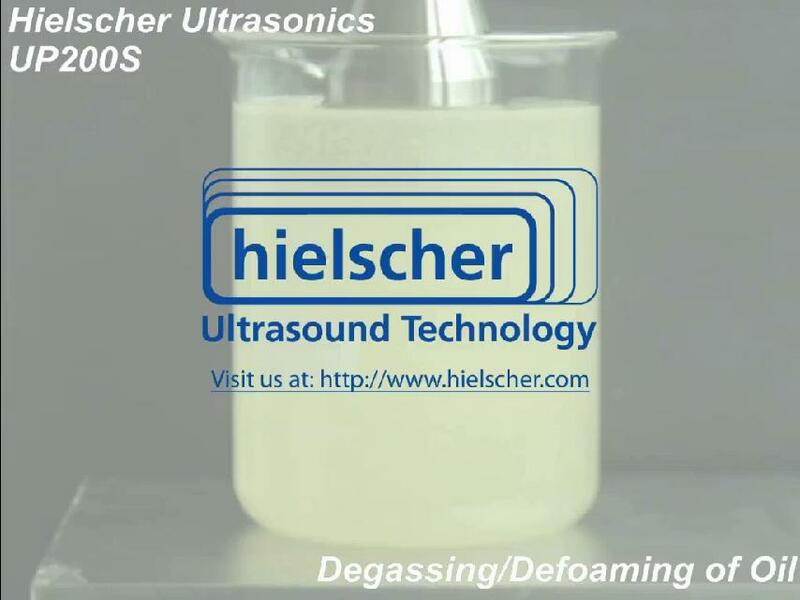 When ultrasonics is applied for mixing, homogenization or dissolving, it assists degassing. The video below demonstrates the degassing/de-aeration of oil (real-time). A Spinneret is a multi-pored die plate through which a polymeric fluid is extruded to form continuous synthetic fibers. When exiting the small orifices of the extrusion die, the viscous polymer fluid starts solidifying and the individual polymer chains tend to align in the fiber because of the viscous flow. At this point solid polymer can start building up at and in the outlet of the fine orifice, resulting in slower flow and eventually in a blocked die plate channel. Cleaning fiber extrusion plates from solid polymer is a difficult task, as the individual channels are typically very small in diameter. Hielscher ultrasonic probes are used to expose polymer fiber extrusion die plates to intense cavitational liquid jets, that are strong enough to remove the solid polymer and impurities – yet soft enough not to damage the delicate geometry of the spinneret capillaries. The latter is a major advantage, when compared with cleaning needles, wires or drills. Although cleaning needles are fine tools, created to clean capillaries of small dimensions repeated cleaning damages the size, shape and smoothness of the capillaries. Finally, the time required for cleaning multi-channel spinnerets is a significant cost factor, too. For acetate, triacetate, acrylic, modacrylic, polybenzimidazole, spandex or vinyon the solvent used for dissolving the polymer can be used for cleaning purposes, too. In this case the cavitational shear will press the solvent into the orifices and promote dissolving. For melt-spinning polymers, such as nylon, olefin, polyester, saran or sulfar, heat treatment prior to the sonication may help to make the polymer more brittle. This process called oven burnout reduces the hardened polymer to ash. For the cleaning, water (with up to 25wt% phosphoric acid) or oil can be used as a simple coupling fluid between the ultrasonic probe and the spinneret. Probe type sonication is much more intense than cleaning tanks and the sonic waves are directed directly towards the spinneret channel outlets. This results in deeper and faster cleaning. For single channels and pores, we recommend using the UP100H with the pointed MS2 tip. This is a cost-effective ultrasonic device for hand-held or stand-mounted operation. 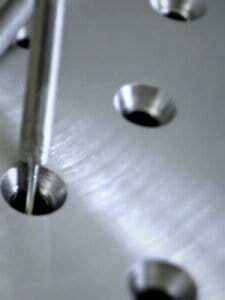 For multi-pore spinnerets or extrusion die plates, the UIP1000hdT with a special 100mm diameter probe. For direct spinning processes, Hielscher ultrasonic probes assist the interaction between the reactants and/or catalysts during the formulation and polymerization of the polymer, e.g. polyester. When gel spinning (e.g. polyethylene, aramid), ultrasonic reactors can be used for the formulation of the gel as well as for shear-thinning of the gel prior to extrusion. The cavitational shear results in temporary lower interaction between the polymer chains. This causes the viscosity to drop – requiring less pressure, allowing for finer filaments to be made or increasing extrusion throughput. Hielscher ultrasonic reactors are a an effective means for the dispersing of nano materials, such as carbon nanotubes, metal oxides or pigments. Ultrasonic cavitation breaks agglomerates at disperses the particles homogeneously.